The two biggest considerations for any burglar when assessing a home or business as a potential target are risk and reward – is the potential reward of a job worth the risk? A business that appears to have a lot of cash on the premises or a house full of gadgets would be worth taking more of a risk because there’s potentially a lot to gain. Likewise, a property that doesn’t necessarily look like an attractive target may be worth a punt because the risk of breaking in is so low (see this recent story for a good example of this). Most would agree that the level of security you have should be in proportion to the property that you are protecting and that does make sense. However, for a more balanced solution you can take a two-pronged approach; paying attention to both the risk AND the reward. 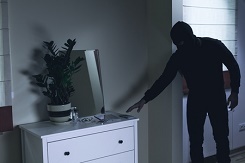 Increasing the risk for a would-be intruder is all about what security measures you put in place – the more you have the more risk of detection for the intruder. Your starting point is your locks. A good set of anti-snap locks is advised for each door because that’s your first line of defence. Don’t sacrifice one for another thinking the front door is more vulnerable than the back – they’ll make their own assessment on how vulnerable it is based on how easy it would be to force entry. It seems obvious but make sure you use your locks. A third of intruders sneak in through unlocked doors and open windows. The next measure would be a burglar alarm. Statistics show that burglars genuinely do view an alarm as a deterrent, particularly if it’s a monitored alarm. 94% would avoid an alarmed house over a non-alarmed one. CCTV takes your security up to another level. Most burglars want to be in and out quickly without confrontation while leaving minimal evidence behind. CCTV would not allow them to do that, especially if they are already known to the authorities. Reducing reward is all about not giving a burglar any evidence that you have things worth stealing. We’ve covered the basics of this in several blog posts, including tips like keeping items in a safe, closing curtains as soon as it becomes dusk, not disposing of packaging for expensive items in your own bins etc. Some assume that because they have the all singing all dancing security system they don’t need to worry too much about doing these things but sloppiness in displaying valuables can also lead to sloppiness in security such as not setting the alarm or even not locking doors. Plus, some more daring intruders may decide that the reward on offer is worth taking the risk, as high as it may seem. You may think that you don’t really have much that’s worth taking and so it’s not worth taking these simple steps or the cost of a security system. This may backfire as some will take a chance just because it’s relatively easy to get in, plus some feel almost ‘entitled’ to break in because the owners didn’t care enough to protect their property (see this account from a reformed burglar). The sad reality is that most believe it won’t happen to them and only take serious measures to protect their property AFTER a break in. In that event, even the best security system can never offer complete reassurance once you’ve been through an experience like that – even if they didn’t take much. We’d therefore urge people to try and prevent an incident – by managing the risk AND the reward – rather than have to deal with one.